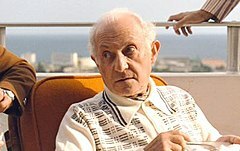 Hyman Roth (born Hyman Suchowsky) is a fictional character and the main antagonist in The Godfather Part II. He is also a minor character in the novel The Godfather Returns. Roth is a Jewish mobster and investor and a business partner of Vito Corleone, and later his son Michael Corleone. He is based on New York mobster Meyer Lansky and was played by Lee Strasberg in the movie. Roth's background is supplied in a deleted scene in The Godfather Part II. In this scene, set in Little Italy, New York in the early 1920s, he is working as a car mechanic. He is noticed by Peter Clemenza, who has been calling him "Johnny Lips". Clemenza introduces him to Vito Corleone, who suggests that he change his name, which was originally Hyman Suchowsky. When Vito asks him whom he admires, Suchowsky says Arnold Rothstein for fixing the 1919 World Series; accordingly, he changes his last name to Roth. Expository dialogue later in the film explains that Roth worked diligently with the Corleone family during Prohibition, and was a close friend and ally of Moe Greene, the "inventor" of Las Vegas. Roth, as well as Don Corleone, started out running molasses out of Havana and into Canada. It is suggested that Vito never fully trusted Roth, nor did many of his associates, including Frank Pentangeli. By the timeline of this film, Roth is based in Miami. Though in seemingly poor health, he is extremely wealthy, having made a fortune by running his own organized crime outfit, assisted by his right-hand man, Sicilian Johnny Ola. Roth forms a partnership with Michael Corleone for a profitable business enterprise with the corrupt Cuban government of Fulgencio Batista and a number of major American corporations. Roth secretly plans to assassinate Michael, partly to avenge Moe Greene's murder (as depicted in The Godfather). Roth instructs Ola to befriend Michael's brother Fredo, who inadvertently provides Ola (and Roth) information about Michael that enables them to mount an attack at his Nevada compound. Michael quickly realizes that Roth perpetrated the murder plot. Remembering his father's advice to "keep enemies close," he maintains a good business relationship with Roth. Michael also suspects a mole within the Corleone family aided Roth, and needs time to uncover his identity. During New Year's Eve 1958/9, the last night of Batista's rule, Michael orders Roth killed, confiding to Fredo that Roth will not see the New Year. Just as Michael's bodyguard Busetta attempts to smother Roth with a pillow in the hospital, Batista's soldiers storm the facility and kill Busetta. Moments later, Fidel Castro's army enters the city, overthrowing the Batista regime and ruining Roth and Michael's plans. Shortly before the Cuban fiasco, the U.S. Senate begins hearings on organized crime. To eliminate Michael as a competitor, Roth manipulates Corleone family caporegime Frank Pentangeli into testifying against Michael by having the Rosato Brothers, two small-time hoods, attempt to kill Pentangeli. He survives and, believing Michael ordered the attack, agrees to testify against the Corleone Family at a Senate hearing. The hearing is really a set piece arranged by Roth in hopes of removing Michael from the scene; the Senate committee's chief counsel is on Roth's payroll. As a counter-move, Michael has Pentangeli's brother, Vincenzo, flown in from Sicily to coerce Pentangeli into silence, thus destroying the government's case against Michael. Roth is last seen at the Miami airport, where he publicly states that he wishes to retire and live in Israel under the Law of Return. (His unspecified medical condition is listed as terminal and he will only live for another six months). His request (like that of the real-life Meyer Lansky) is rejected by the Israeli High Court, reportedly due to his criminal ties. Michael arranges to have Roth killed at the airport where he is about to be taken into U.S. Federal custody. Minutes after disembarking the plane, he is fatally shot by Michael's caporegime Rocco Lampone, posing as a reporter. Rocco himself is killed by federal agents as he is escaping. ^ "Fact and Fiction in The Godfather". crimelibrary.com. Archived from the original on April 3, 2014. Retrieved 2014-06-24.